Samsung has extended its P-Series of notebooks, with the 15.6 inch P580 notebook pitched squarely at the more serious pro market. The P-series boasts either Core i5 or i3 processors, can come with Nvidia GT 330M graphics and an LED backlit display. Samsung has also chucked in what it describes as the borderline oxymoronic 'heightened industry-standard security'. "Samsung's new 15.6" P580 notebook has been designed to be the perfect 'trusted business partners' for individuals who need the reassurance and performance of a powerful desktop PC, packaged in a highly durable, tactile, sleek and lightweight chassis that makes remote or mobile working easy and pleasurable," says the company's release. As you may imagine, the machine comes with Windows 7, full size keyboard and numeric keypad and Wi-Fi, Bluetooth 2.1 and USB 2.0. 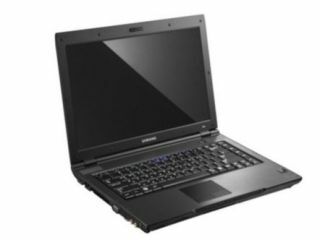 The P580 notebook has a UK release date of April, and is updatable from a Core i3 330M to Core i5 520M and from 2GB to 4GB of RAM with prices not yet published.